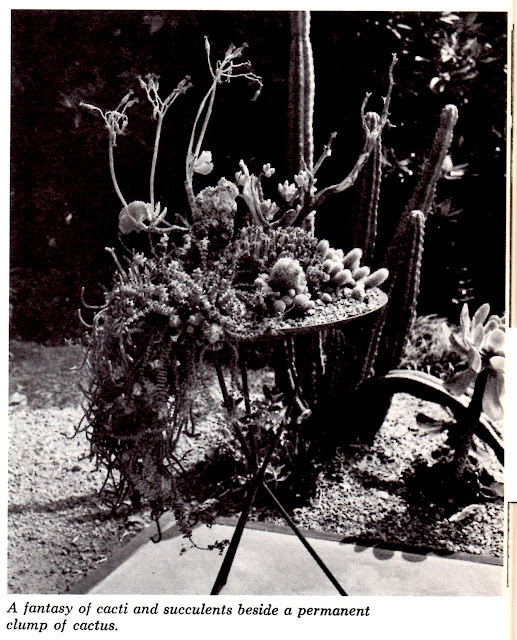 All photos and text from Cacti & Succulents, written by William C. Mulligan, published by Grosset & Dunlap. There are some pretty entertaining nuggets in this book, I especially liked the "garden under a glass dining table" introduced by the Trumans at the White House. Hope you enjoy! Living with greenery is an increasingly popular trend: more and more people are recognizing the warmth and decorative beauty of plants and the enjoyment of tending them. And while many of are filling and surrounding our houses with growing things, we don’t always have as much time as we would like to devote to their care. 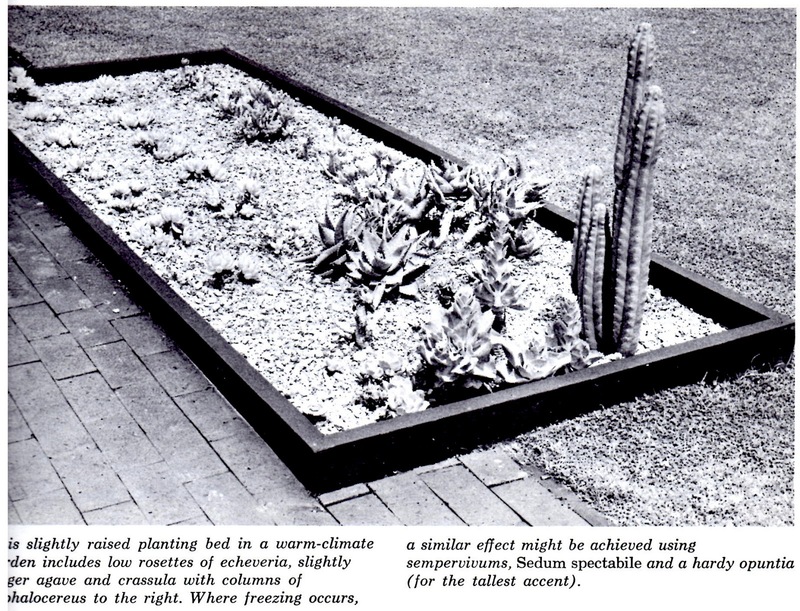 Cacti and succulents are the answer to this dilemma; the make handsome and unusual additions to any environments, yet require relatively little upkeep." 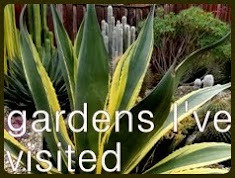 For those cacti and succulents that are especially sensitive to moisture, substitute a thin layer of attractive gravel for the very top layer of soil. 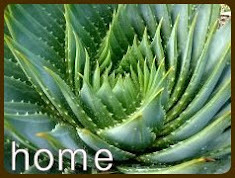 This will keep the plant from coming into contact with excessive moisture and adds an exotic touch. 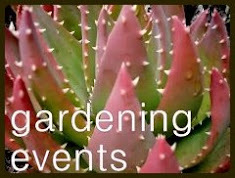 Another rule that can be applied generally is never water either type on cold or overcast days…"
For the display of cacti and succulents in your home, there are no hard and fast rules concerning arranging and grouping. 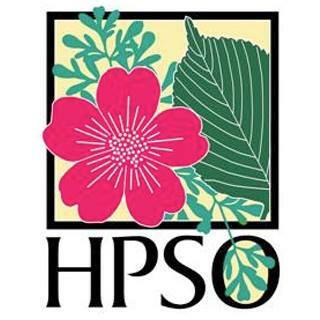 Try to achieve a distinctive effect by relying on your own sense and knowledge about the plants’ natural habitats. Cacti often stand alone in the desert, and for that reason a single potted cactus lends and austere and dramatic focal point to any room setting. Above all, don’t be afraid to be original or adventuresome. Experiment with the contrasts and similarities of totally unrelated plants. If you want to set ferns alongside cacti, no one could be displeased by the beautiful counterpoint of these two opposite ends of the plant spectrum." Architecture is a matter of major concern when you are dealing with these desert and jungle plants. Spanish or stucco frame dwellings suggesting the south can be greatly enhanced with softening succulents of size or large doorside cacti of height, with rounded raised beds of smaller plants in place of antique cannas and such. 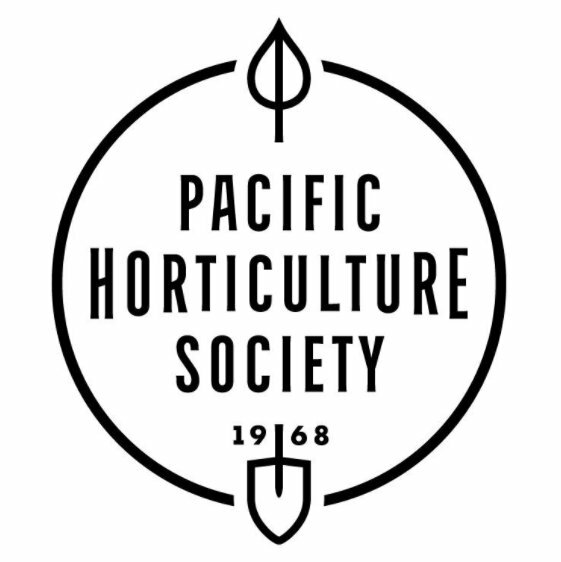 Some northern perennials of similar shape and quite tones, such as lupines, the dollarlike silver honesty and green and white caladium, can look appropriate at a distance…Or mix plantings without regard for city or climate. The challenge is here." A few decades ago, our grandmothers covered every available sill and table with African violets, behind a sun-softening curtain to protect the foliage from burning. Today, many of us have our plant craze, and none is more satisfying than cacti and succulents. 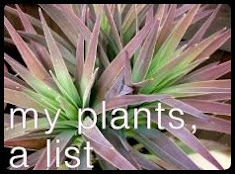 Some genera—aloe, agave, opuntia and many other listed in this book—are so broad that a compulsive collector can easily turn to any one of them. 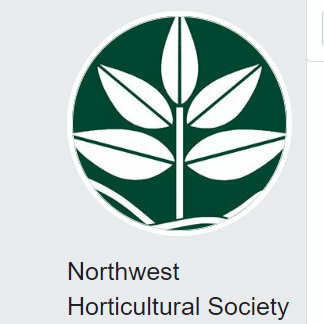 Often, after a few years of seeing variety, one settles down to the expertise of collecting one genus, joining its society and visiting its shows, even taking tours with a master horticulturalist to see for oneself the great collections." 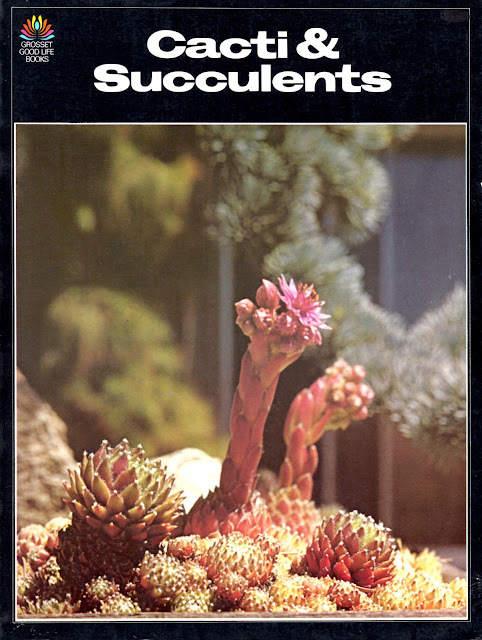 "With more than two thousand species of the cactus family to choose from and several tens of thousands of succulent plants…well, why not specialize in collecting? Nobody ever collected them all." Each is like a piece of living sculpture. Select with care, then give each a container uniquely suited to showing it off. Although you may cultivate the plants wherever you can give them the best care, from time to time bring each to a living area where it can be lighted dramatically and properly appreciated by you and your friends." 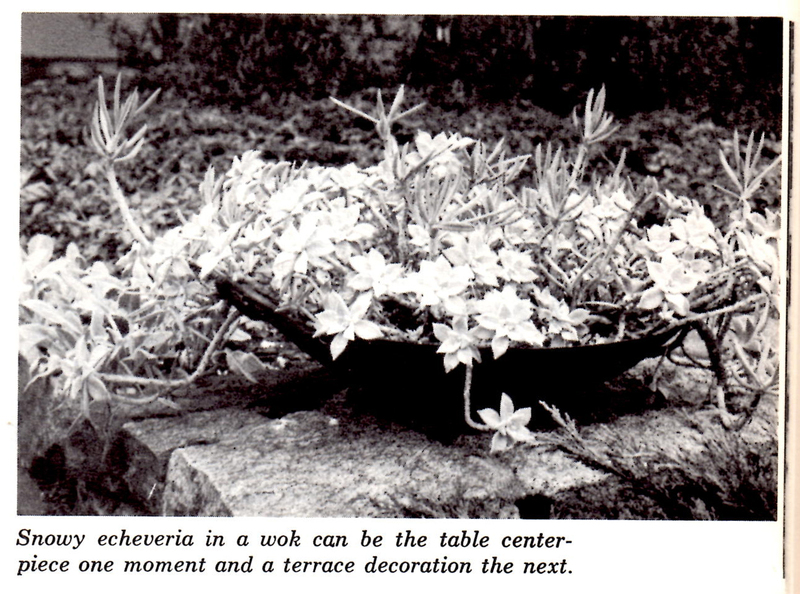 I totally want to plant up a wok now. Me too! I think a trip to Goodwill is in order. "Nobody ever collected them all" sounds like a challenge or maybe even a mission. Good morning Ms. Danger. 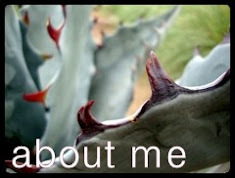 Your mission, Loree, should you choose to accept it is to collect all species of cacti and succulents. As always should Andrew become angry or crowded out of his living space by the plant hoard, the Outlaw will disavow all knowledge of your actions. This tape will self-destruct in five seconds. Good luck Loree. LOL. 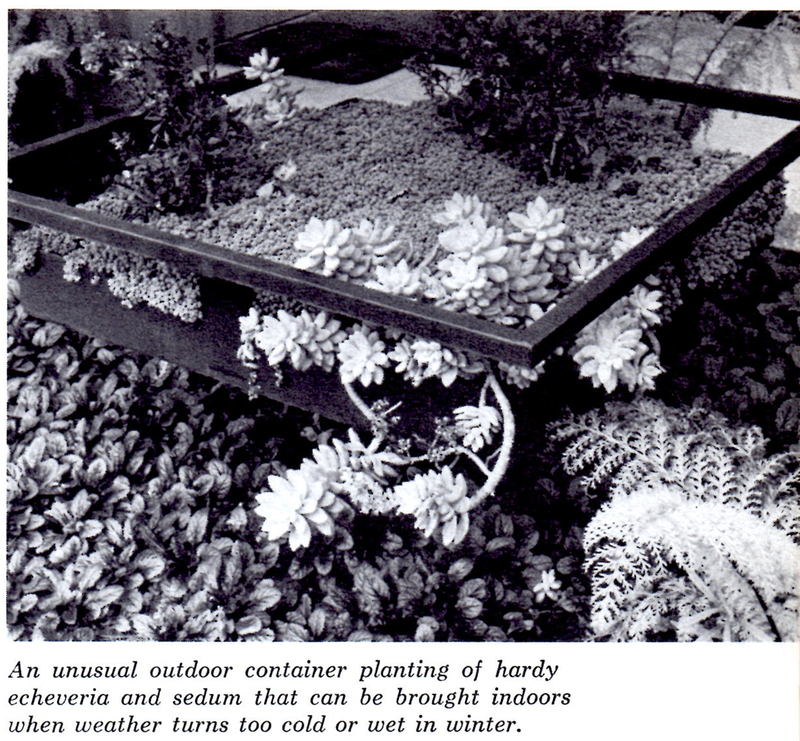 Our library has a lot of 1970s gardening books. They seem so quaint :-). Funny coincidence: This summer my in-laws gave me a wok they had picked up in a yard sale, specifically for use as a succulent container. Your personal library or the Davis library? Quaint is the perfect word! So have you planted up the wok yet? Nope, I haven't done anything with the wok yet. I guess I should rescue it from the possibly-to-be-gotten-rid-of pile, just in case I'm overcome by a burning desire to do something with it. Or I could give it to a fellow succulent lover. If you lived here in town, I'd take it over to your house right now! I very much enjoyed this look back at the 70s. I love the huge succulent bowl under the glass dining table. I've actually had a little bug in my ear lately about doing something similar in a huge glass bowl to sit on top of my glass topped coffee table. I've been haunting thrift stores and craigslist trying to find a bowl big enough, but so far no such luck. I may just have to go with a shallow pot, but I really like the idea of clear glass. See how retro-cool you are, and you probably didn't even know it! Good luck finding the right thing...you might stop in IKEA if your up that way. Thanks for the tip about maybe using one of those vessel-type sinks! Great idea! 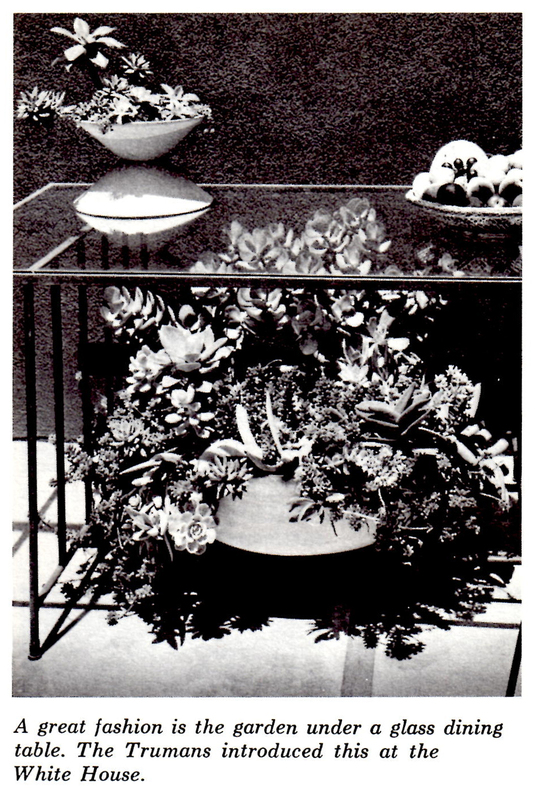 Nothing sells me on plants and garden design better than black and white photos! 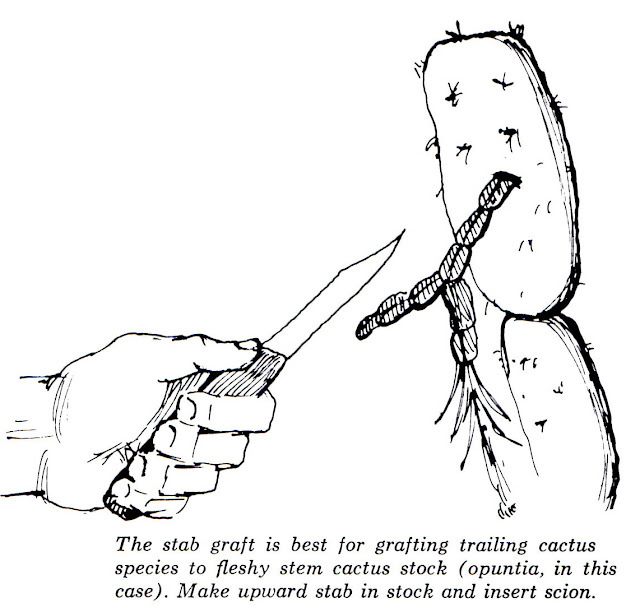 Also, doesn't the grafting illustration look like a police artist reconstruction of a crime? An innocent Opuntia (with x's for eyes and tongue lolling out) was in the wrong place at the wrong time. You know when I started reading through this book the first thing I thought is how lucky we are to be living right now in the era of cheap color printing and digital photos. Although I have to admit I have many more family photos from back in the day when I actually had to pay to print them. And yes! Totally for the grafting/crime seen drawing...it is rather graphic. oh how I love it!!!! I like when they say: "from time to time bring each to a living area where it can be lighted dramatically and properly appreciated by you and your friends." 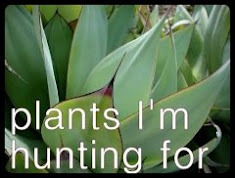 I think I sometimes force people to appreciate certain plants. They know they wont get away until they agree about its epicness. 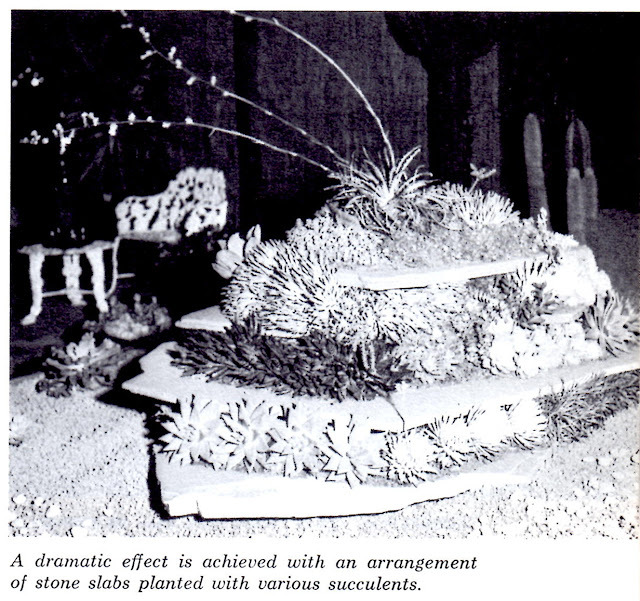 I loved that part too...I could just see a bunch of 70's hipsters at a party (in their sunken shag carpeted "conversation pit") admiring the hosts latest cactus arrangement! Someday your friends will thank you. I'm sold on the slab stack planter and the huge round outdoor planter with the pine and grenovia! Just shows you the old books have lots to information offer - and cool glimpses into mid-century decor as well. Yes, that pine planter shot is fabulous! (sorry Louis, epic!) And I love looking at old books, used bookstores are the best! Although did you see that story about bed bugs being an issue in library books? That kinda freaked me out. Andrew joked it was just a nasty rumor being spread by the Kindle/Nook/etc makers but if they are in library books doesn't that mean used books are even more suspect? Seriously? I missed that about the bed bugs. I think I'll adopt Andrew's response, because I'm not going to stop bringing home old books. I must admit when I picked up a book at the library yesterday I looked through it before bringing it home. Indeed! And to think "compulsive collector" is actually seen as a good thing! Ah...good work Jenn! I hadn't heard of it either but love the look of it paired with that tree. Haha, stab grafting. Will have to give it a try! Nice book, nice ideas, nice font. I bet it even smells nice. "grassy notes with a tang of acids and a hint of vanilla over an underlying mustiness" sounds so much nicer than "volatile organic compounds"...to tell you the truth though some used book stores make me want to go home and take a shower. Remember all the comments about "how long can this cacti and succulent fad last"? I love the "fantasy of cacti and succulents". Does that mean it's not really there and we're all just imagining it? Yes! My experiment with group hypnosis via the internet worked!!! Our back garden, the next step? Why Grow That, When You Can Grow This? Well aren't you the little thug?